Though there have been many incidents of Car fire during the last year including that of the leading car maker's Tata Motors Nano, Maruti Suzuki Alto, Dzire, Volkswagen Vento but this time its Skoda. 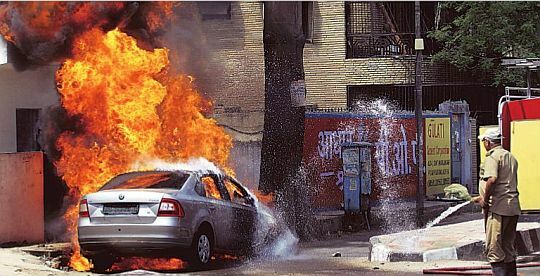 The Czech based car maker has been popular in India but in a shocking incident at New Delhi, where a Skoda Rapid sedan has apparently caught fire due to what a leading newspaper report claims to be an electrical short circuit. This short circuit has also meant that the car which went up in a fiery blaze has had its entire front end damaged due to the fire, before fire tenders arrived to douse the flames. The owner of the Skoda Rapid, one Mr Nitin Mehrotra, claims to have been visiting a doctor, only to return to see his Skoda Rapid in flames. Other details of this incident remain unknown at the moment. The company officials says" We are aware of the case and have been in constant touch with the customer. Our technical team will carry out an inspection as early as tomorrow to evaluate the case. In the interim, we have extended full cooperation to the customer to reduce any inconvenience."